Cupro Nickel Sheet and plate are utilized in producing condenser plates, heat exchangers, evaporators, ferrules, salt water applications and water coolers. 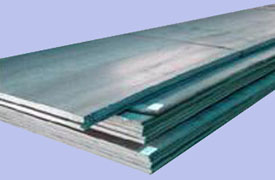 All Metal Sales Corp. offers Cupro Nickel Sheet and Plate in three different delivery methods. 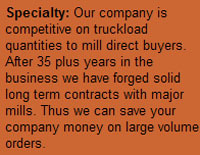 From inventory from prompt delivery, from our mills in 40,000 lb. truckloads for the absolute best price level, and on a dedicated just-in-time method to utilize mill pricing while combining 48 hour delivery dates from your release instructions. By offering these three options, we can meet your time frame requirements with custom ordered and manufactured products delivered as you need them. By utilizing available alloys, alloy 704 (95/5), 706 (90/10), 710 (80/20), 715 (70/30), with a melting point of 2260 degrees F this product is high heat resistant. Available sizes: .040" to 5" x 48" to 96" x 96" to 216".